Gaming phones are increasingly becoming A Thing in the smartphone world, and we largely have Razer to thank for that. Last year’s Razer Phone kicked off a trend and with the sequel, Razer must answer the new competition as well as address criticism of its first gaming smartphone. In this review, we'll see how successful this has been. With its debut device, Razer was able to undercut the prices of the flagships from its competitors from South Korea and China. It wasn’t much cheaper, but it still made a difference, since the established brands had price tags that were nearing the $1,000 mark. The first generation Razer Phone had a price tag of $699, and the price of the successor has gone up to $799. Now that Razer has established its name in the smartphone world, it can dare to ask a little more. So what do we score for that extra hundred bucks? At first glance, the Razer Phone 2 looks a lot like the OG gaming phone. A block black candy bar shaped industrial aluminium frame with a 16:9 display bordered by thick speaker grilles. Measuring 6.2 x 3.1 x 0.3 inches and weighing in at 7.76 ounces, it's only slightly heavier than the previous model. From the front, at least, it seems like Razer is sticking to their guns when it comes to design . That’s not necessarily a bad thing. I appreciated the first Razer phone for its integration of function and form: the angular design and front-firing speakers, and wider screen size all made sense for a gaming smartphone, so it makes sense that they are kept on for the sequel. It is at the same time deeply unfashionable, bucking many industry trends. But it’s on the back that we find that Razer has paid more attention to aesthetics. 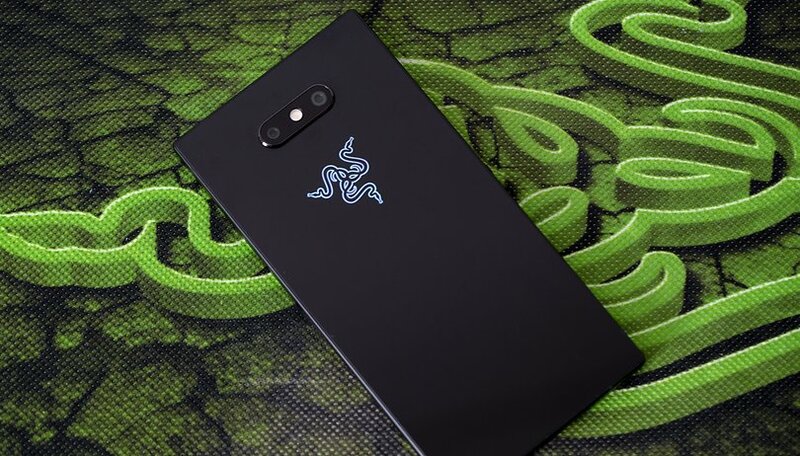 The first Razer Phone attracted some criticism for being rather dull looking, with a matte black finish and lacking the brand's trademark Chroma RGB lighting which embodies the Razer aesthetic across its product range. Accordingly, we find that Razer has taken a few steps to make the second phone more attractive and premium-feeling on the back. The Razer Phone 2 joins the trendy flagship fashion club in one sense: the back is now slathered in Gorilla Glass 5, so shiny you can see your face in it. This isn't only for the look - it also means that the Razer Phone 2 supports wireless charging according to the Qi standard, and of course Razer will be releasing their own wireless charging base station with RGB lighting to go with it. The rear dual camera has also been moved to a more aesthetically pleasing central position, and most significantly, the Razer logo on the back lights up. Razer's Chroma RGB lighting is used on a wide range of its products, from laptops to speakers to coffee cup holders. Now the second Razer Phone feels like a proper member of the family. All the light modes for the logo can be freely configured via a dedicated Chroma app. On the left side we see the volume buttons and SIM tray, which has switched sides. The right side has the combination power button/fingerprint sensor and a USB-C port for charging and connections on the bottom. Although Razer has listened to criticism of its first Phone in many aspects, demands for a headphone jack have gone ignored. I don't blame them, even if I would appreciate it, it would seem like a step backwards. Although the Razer Phone 2 is still a black bar, the edges are slightly more rounded than the previous generation. It's subtle, but does make the phone more comfortable to grip. The speakers are sealed to protect against water and dust. Although Razer conducted the IP67 certification test on the device, it is not officially certified. Nonetheless, it fixes one of the most annoying vulnerabilities of the first Razer Phone, and you have some peace of mind while walking in the rain or a dusty area. All in all, the Razer Phone 2 has acquired a few more cosmetic touches that give it more of a premium feel while maintaining its distinctive cyberpunk-y aesthetic. Black and neon colors aren't everyone's idea of cool but Razer is still keeping its core audience in mind. The Razer Phone 2 may look and feel like more of a flagship now, but that doesn't mean it handles like one. In my long-term use of the first Razer Phone, I appreciated how its unfashionable size and shape had its benefits when gaming. The 16:9 format is more enjoyable for games and multimedia when you're holding it in landscape mode and you've got those heavy duty speakers firing sound right into your face. It's great. For non-gamers who are for some reason considering the Razer Phone 2, keep in mind that this shape isn't the most handy. Compared to a slim 18:9 modern handset with smooth round corners that easily slides in and out of the pocket, the Razer Phone 2 still feels quite unwieldy to carry around and feels too wide in the pocket. For a frequent mobile gamer, this is worth the trade-off. If you're just using your phone for social media and snapshots, it's hard to justify. If the original Razer Phone had one killer feature, it was the 120Hz LCD display, and the Razer Phone 2 boasts the same selling point but with a few improvements. The WQHD 5.72-inch 2,560 by 1,440 display keeps this maximum refresh rate (a 144Hz refresh smartphone display remains a fantasy for the future, for now) but has improved brightness over its predecessor. This is noticeable when using the phone out in bright daylight, or wearing sunglasses. The original Razer Phone could be hard to read outdoors but I haven't had issues using this one in the sunshine. Still not the brightest screen out there, but not such a point of frustration like it used to be. Color representation, while decent to the naked eye, still leaves something to be desired. In our tests, the Razer Phone 2 at 'vivid' color settings failed to cover the DCI-P3 spectrum, contrary to expectations set by Razer's promotional materials. But the display's main attraction is its speed. The ultrafast refresh rate (twice as fast as the typical 60Hz rate you'll find on most smartphones) will of course catch the eye of gamers, as it ensures a smooth and responsive graphics performance in high-end games, without the dropped frames and screen tearing than can spoil the experience on lesser displays. It's not just about enjoying a pretty picture. Competitive gaming and esports is getting bigger and bigger, attracting investment and gaining a wider audience. Mobile gaming, once considered a low-end sideshow by gamers, is also getting in on the action. Games like PUBG and Fortnite are now widely popular on mobile alongside more niche titles like the mobile MOBA Arena of Valor (huge in China under the name Honor of Kings). Gamers are now looking at phones that can not only run these more demanding games smoothly, but also for anything that can give them a competitive edge. If your screen is refreshing at a faster rate than your opponent, it's updating with more information and giving you a chance to react to the situation before your rival does. Razer calls this UltraMotion, and it is so far unmatched. Here we come to another of those compromises that are characteristic of the Razer Phone. To have the fastest display in town, you have to do without the advantages (such as deep blacks and more vivid colors) of an OLED. Razer's main competitor in the high-end gaming smartphone market, the Asus ROG Phone, has an OLED panel that still lags behind at 90Hz. Note that a fast refresh rate on your device display doesn't always guarantee an advantage. Many games that are looking for mass participation or want to level the playing field will have a 'cap' of 60f frames per second or even lower. Fortnite, for example, keeps this rate around 30. Games that support the Razer Phone's 120Hz are still a minority but increasing in number, especially as Razer makes partnerships with game publishers to work towards this. The new Cortex app, which I go into later, helps to point the user to compatible games. Even when you're not gaming, the 120Hz refresh rate display is still a dream to use, as it absolutely glides through busy feeds such as those typical of social media apps. Every operation on the Razer Phone 2 feels blisteringly fast, not just because of the hardware, but the display brings information on screen faster. And of course, the killer display and speaker combo that make the Razer Phone 2 a great gaming device is also good for multimedia in general. It supports HDR on Netflix, so if you feel like something less interactive, it's a good choice for watching movies on the go. You have the option to customize the phone's refresh rate in the settings menu, down to 90Hz or 60Hz, for example. 90Hz is actually the default setting out of the box, but once you get used to 120Hz it's hard to give up. Once I was accustomed to the original Razer Phone, even top-range competitors such as the LG G7 or Galaxy S9 seemed sluggish in comparison. Picking the Razer Phone 2 and cranking up the refresh rate felt like an invigorating breath of fresh air. The Chroma lighting on the Razer Phone 2 can be configured by a dedicated app . It can glow only to show notifications, or only when the screen is on, or just all the time. Brightness and frequency can be controlled (e.g. it can be static, 'breathe' on and off or cycle through the color spectrum). Razer claims 16.8 million color options are available, and frankly, I lost the patience to count them, but there is enough choice to satisfy the most fussy of aesthetes. In theory LEDs for notifications could be useful (although you cannot choose colors for different kinds of notifications), but how often do you leave a phone down on its front for a long time? No, the golden rule here is the rule of cool, it's just plain nice to look at. Especially if you have a PC rig set up with LEDs like I do, it's a pure pleasure to watch the colors play alongside each other in a darkened room. Once the novelty wears off, you might find yourself limiting Chroma to low settings just to save battery life. After all, it'll mostly be either in your pocket or facing away from you while your attention is on the screen. The Razer Phone 2 cleaves close to stock Android OS which should please fans of the pure Android experience , even if there's more green around than usual. Unfortunately, it doesn't ship with the latest Android 9.0 Pie, but rather Android 8.1 Oreo with an update to the new version expected via OTA. Let's hope Razer doesn't leave us hanging. Also making a welcome return is the included Nova Launcher. This makes customizing your smartphone easy, and stock Android + Nova Launcher is a good recommendation for anyone looking to refresh their phone's software. Luckily, Razer provides this from the get-go, without the bloatware that say, Samsung or Huawei loads their handsets with. This doesn't mean that there's no special software from Razer, quite the contrary. The Game Booster app, which lets you allocate resources to your games (either all of them in general or on a per-game basis) is here again and quite essential for anyone who wants to balance their gaming and battery life. Clock speed, resolution frame rate and anti-aliasing can all be set according to your preference. A "Do Not Disturb Mode" is also possible to block notifications while gaming. Game Booster also helpfully gives me an estimate of my battery life if I continue to jack up game performance like a maniac. This time Game Booster is integrated into the new Razer Cortex app, essentially a one-stop app for all your mobile gaming needs. Cortex keeps a library of your games all in one easily accessible place and I appreciated the organization. It also has a 'featured' section that recommends games to download and points out titles that support the120Hz refresh rate. This featured section could do with some improvement...it would be nice to dive deeper into sections if offers (for example, it recommends four 120Hz games on its front page...there are more but I can't expand the list), and it still recommends games that I already have installed. Of course, the Razer Phone 2 is well-equipped to handle the most demanding modern mobile games with ease . The new Razer Phone uses a Qualcomm Snapdragon 845 (Adreno 630 GPU on board) with 8GB RAM and 64GB of internal memory (expandable via MicroSD). The battery is a hefty 4,000 mAh. The spec sheet of the Razer Phone 2 is very similar to the first one, with only the processor getting a significant upgrade. We've got the obligatory annual improvement to the SoC: a 2.8GHz Snapdragon 845. Razer claims that this could bring a 40% performance boost compared to the previous generation, but in my case, I found that it made little difference to the naked eye even when playing demanding games like PUBG and Shadowgun Legends, for example. But there's also future-proofing to consider. High-end mobile gaming is just gaining momentum, and increasing hardware requirements will be part of the picture. Benchmarking the Razer Phone 2 shows the expected improvements over the first in every metric, but it's a mixed bag compared to contemporary high-spec competitors such as the OnePlus 6 and Galaxy S9+. In daily use, whether it's gaming or just web browsing and light apps, it's hard to notice differences in performance with the naked eye. Pure performance isn't the whole story when it comes to gaming though. High-end flagships also easily meet the technical performance level for demanding games. It's with additional features, such as the speakers, refresh rate and specialized software, that Razer conveys its gaming brand to potential customers. Razer forgoes the typical heat pipes used for SoC cooling in favor of a custom vapor-cooling chamber system. The intention here is to provide a greater surface area for heat to dissipate. The device still gets noticeably warm over a long gaming session, but never reached a point where I was uncomfortable or had to put it down to cool. Even as the phone heated up, I didn't notice any appreciable drop in quality in game, however. While 8 GB RAM is more than enough for anything a smartphone could ever do, 64 GB of storage can run out surprisingly quickly if you're collecting high-end mobile games. For example, PUBG Mobile takes up 1.65 GB, Fortnite 2.55 GB, Samorost 3 1.09 GB, Street Fighter IV 2.3 GB, XCOM: Enemy Within 3.5 GB. You can manage by uninstalling apps until you need them later, and using microSD cards for photos and videos, but at least 128 GB storage on the Razer Phone 2 would have been nice to have, especially since competitors are offering 128 GB and even 512 GB phones. There is a 128 GB variant of the Razer Phone 2 expected, but this version will lack a glass back, and presumably the wireless charging advantage that comes with it. The Razer Phone 2's big, blocky bezels serve a purpose. Just like with the first Razer Phone, they house powerful front-firing stereo speakers that provide a strong sound. The Razer Phone 2 has Dolby Atmos for Mobile for immersive, realistic audio. It also supports 5.1 surround sound for Netflix. All in all a fantastic device for enjoying music, radio and other multimedia directly from the phone without the need resort to external speakers. The first Razer Phone's speakers were great, but had a tendency to attract specks of dust, sand and dirt that would be very difficult to extract. This time, Razer has covered the speaker grill and tested the device for IP67 resistance against water and dust, but do we lose any audio quality for it? Cranking up Razer Phones 1 and 2 to max volume and blasting away, it does seem like Razer Phone 2 is just slightly less loud at max volume than its parent. But that's still a level of volume that you're rarely going to use or need, so I'd say it's a welcome trade-off for the extra safety. Speakers often get the short shrift in modern designs, which sacrifice audio output in favor of a slimmer, bezel-less body. That's not the case here, but fans of the good old 3.5mm audio jack still have to dongle up if they want to use wired headphones. Thankfully, Razer includes a high-fidelity USB Type-C DAC that supports up to 24-bit audio. This is hardly the most elegant solution, but respect to Razer for including a dongle in the box rather than attempting to milk consumers to pay for it a la Apple. If you're gaming on the go or on public transport, you won't necessarily want to blast the speakers, and Bluetooth headphones still have some audio latency. If you're playing a game in which you need to carefully listen for enemy footsteps, shots, or other audio cues and the Bluetooth delay is getting you down, the dongle is there for you. 2017's Razer Phone didn’t quite meet our expectations in the photography sector, but the Razer Phone 2 has updated its sensors . The rear camera setup now consists of a wide-angle Sony IMX 363 sensor (12MP AF f1.75 with OIS) and a telephoto camera with an IMX351 sensor (12MP AF f2.6). 4K video recording is possible. The front camera is an 8MP FF f.20 snapper, and is capable of 1080p video, handy for live streaming. On paper, this means that the Razer Phone 2 has the same main sensor as the Xiaomi Mi 8, for example, which did really well in our tests. But sensors don't tell the whole story. The quality of photos and videos on a smartphone is strongly dependent on the software. That Razer is still working on the software was apparent during the review period. My unit received 2 major updates within a week, both with camera software upgrades and one coming in just before the publication of this review. Even while it may still be a work in progress, the Razer Phone 2 improves upon its predecessor's weakest point but it hasn't miraculously jumped up the camera hierarchy. Photos are better, but it's still not a phone for photography enthusiasts. The Google Pixel phones or iPhones have nothing to worry about. You can see for yourself in the selection of snapshots below. The actual camera app itself has been made more user-friendly, the layout is redesigned to make it faster and easier to use one-handed, and there's a couple of special photo modes: 'Portrait' for that popular bokeh blur behind the subject, and 'beauty' mode, which has a slider that makes your selfies more glamorous (read: smoother, slightly more rounded and brighter, and really unnatural-looking). Razer Phone 2 inherits the same 4,000mAh battery as its ancestor . This big battery helps you get through a day of regular use and get a few hours of gaming into the mix too. I certainly never had any panic over a low battery percentage using the phone, and at a stretch, over a day and a half away from the charger was no problem. But your mileage may vary on the battery, depending on use. Your Game Booster settings, Chroma settings, and refresh rate setting all affect battery consumption (do you really need those lights on all the time?). When I conducted the PCMark battery test, I did so with full refresh rate, medium Chroma settings (though the screen is on for effectively the whole test), and Game Booster on maximum performance, with a 5h 53min score. That's under competitors like the OnePlus 6 and Galaxy S9, but because of the different settings that can be tweaked, there's a lot of difference the user can make according to their needs. Charging via the included branded charger and braided cable is very fast, thanks to Qualcomm QuickCharge 4.0+. For example, it took me about an hour and a half to recharge almost 75% of juice. Wireless fast charging is possible via Qi compatible base stations and Razer's own upcoming charging base station (with Chroma RGB lighting, naturally). While I look forward to testing out Razer's base station for comparison, for the moment charging with the cable is very satisfying. The first generation Razer Phone was really something new, a trend-setter that stood out from the crowd. When it comes to the successor, Razer isn't re-inventing the wheel, but rather shoring up the weaknesses that were apparent in the first offering, taking the criticism of fans to heart. All the good points: top-notch hardware, signature 120Hz display, powerful speakers, fast charging, etc remain. Weak points of the original, such as the dull design and underwhelming camera, have been addressed and improved. Aside from better cameras, the Razer Phone 2 has a glossier, more premium look and of course, the snazzy backlight. You know longer have to be embarrassed by your expensive smartphone's camera, and the glass back with illuminated logo will hopefully provoke a few reactions of ''oh, that's cool'' instead of ''oh, that's weird...'' from your peers. Of course, the Razer Phone 2 is still a Razer Phone. There are compromises to make. The angular corners are still going to poke your thighs, the speakers are still basically giant bezels and the panel is still LCD. Some premium features such as slow-motion video and face unlock are missing. In my evaluation of 100 days with the Razer Phone, I compared the device to an awkward, edgy teenager. In just a year it looks like the kid has matured significantly but still stays confident in its own style and personality. That's gratifying to see. Of course, the gaming smartphone market is much more crowded than it used to be ever since Razer opened up new possibilities to rival manufacturers. Phones such as the Honor Play will attempt to undercut thanks to a lower price. On the other end, a more luxury offering like the $900 Asus ROG Phone aims to beat the Razer Phone 2 through a combination of power and extra features such as ultrasonic shoulder inputs, a side charging port and tons of fancy accessories. When we have both devices in office, a direct comparison between the two big-name gaming brands will be an interesting contest. Considering the competition from the likes of Asus makes me wish that Razer had been less conservative with its second smartphone. If you bought the original Razer Phone last year, number 2 is better in a few respects but hardly an essential upgrade. It's possible that Razer will continue to distinguish itself in the mobile gaming space with accessories such as the Raiju Mobile game controller. Perhaps we'll even see the Project Linda laptop dock become a commercial reality. If you wanted a Razer Phone but decided to wait for the second generation, you'll find your patience rewarded by a powerful handheld gaming device that's also matured into a decent premium smartphone with a more elegant look. There are few surprises in store, but the improvements won't disappoint anyone looking for a top smartphone oriented towards a gaming lifestyle. For non-gamers, however, the compromises in the design and camera are unlikely to convince them to forgo the likes of Samsung and Huawei.